Q – Can I change the customer’s account set when entering an invoice in Accounts Receivable? multicurrency ledger, the new account set must use the same currency as the customer. Q – Can I default the posting date to be the session date when posting a transaction in Project and Job Cost? separate document and posting dates. you enter or edit them. Q – Is there a way to merge territories in CRM? A – Yes. The reorganization of territories is a common aspect of organizational change. In SageCRM 6.0 the new Territory Administration enables you to merge territories and, more significantly, the data associated with those territories. Select Administration | Users | Security and click on the Merge Territory button. Select the source territory—which will be absorbed into the target territory—and click on the Next button. Select the target territory. After selecting the target territory, you are asked whether you also want to transfer Users and User Rights to the new territory. Click Next to start the merge. Note: The merge process involves a major update to the database. This means that before committing to the merge, administrators should perform a backup of the database and ensure that all users are logged out of the system. Users should also be informed that they will be locked out of the system during the merge process. Q – How do I perform a mass update in CRM? Select My CRM | Groups and click on the group whose records you wish to update. All records are selected for inclusion by default. Select the records you wish to exclude in the Exclude column. Click on the Mass Update button. 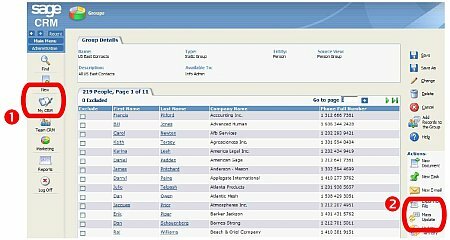 The Fields screen displays all the fields associated with the entity’s records. Select the Assigned To checkbox and click on the Continue button. The next screen allows you to enter values for the selected fields. Select the user to be assigned to all the selected leads from the group. Click on the Save button. A confirmation screen displays the number records changed. Q – Why does the post finance charges option grid close after specifying the Cust Misc Code field option? A – When trying to post finance charges for customers in Sage Pro ERP, the Post button is disabled in the Post Finance Charges option grid after all options fields have been specified. The option grid screen disappears after specifying the Cust Misc Code option field. To resolve the issue, verify the Default Transaction Category field is populated with a valid code located in the Change Account Receivable System Information screen. The first three characters of the Transaction Category code is the Sales Category code. If it is blank it will create this issue. Under the File, click Change Setup Information. Type "DEFDEF" into the Default Transaction Category field. Key value DEF not found. Adding new record. Type the appropriate information into the Description, Sales Revenue, Cost of Goods and Item Discount fields. General Ledger accounts are needed to finalize the setup of the "DEFDEF" transaction category code. Please consult with the appropriate authority to determine the appropriate sales revenue, cost of goods sold and item discount accounts before proceeding. Adding "DEFDEF" as the default transaction category code in the AR Change Setup Information screen should allow the Post button to be activated in the Post Finance Charges option grid. Finance charges can now be posted in Sage Pro. Q – In Payroll, what is Accrual and Benefit Pay Type Rollover? Accrual Year Rollover – Rollover will commence on the Next Rollover Date. However if it is not selected, the rollover will occur when the Payroll year is closed. Next Rollover Date – This field is compared with the Payroll system date during check printing. If the Next Rollover Date is less than the Payroll system date, the rollover will occur when regular checks are printed. Q – Where is the reference to an Item Image File stored? A – The ability to add a picture to an item was introduced in Sage Pro 7.2 Build 3200. In the Item Master Maintenance screen, an image can be added to an item in the Picture tab. Click Add to launch the Windows browsing screen and select the image file. When the image file is selected and saved, the path information for that file is saved to the ICIIMG table. For more information on this feature please refer to the Sage Pro Inventory Control documentation. This entry was posted in July 2008, Newsletter and tagged ACCPAC, Axis Newsletter, CRM Features, CRM Software, Customer loyalty, Customer Relations Management (CRM), Customer retention, employee retention, Enhanced customer satisfaction and retention, Enterprise Resource Planning (ERP), ERP Solutions, Human Resources (HR), Human Resources Management System (HRMS), Improved Profitability, Increase efficiency, Increase productivity, Increase profits, Increase revenues, Sage Accpac, Sage Accpac ERP, Sage CRM, Sage HRMS, SageCRM. Bookmark the permalink.